This spring, Smart Interaction Lab’s NYC branch went uptown to the Museum of Arts and Design (MAD) for one week to be part in an intensive designer residency to explore the future of desktop 3D printing. 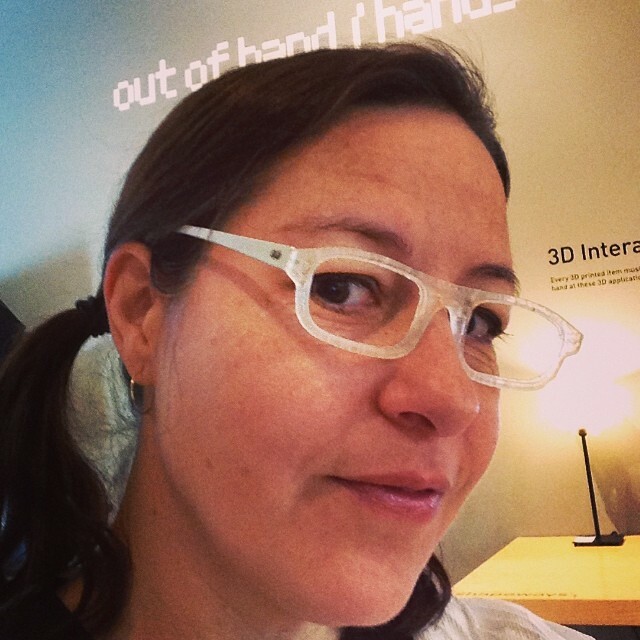 The program, sponsored by the online 3D print-on-demand service, Shapeways, featured a different designer every week and was part of a larger exhibition entitled “Out of Hand”, which explores extreme examples of art and design created using digital fabrication techniques. Out of Hand is on display until June 1. During our week at the museum, lab founder Carla Diana was on hand to chat with museum visitors and share stories and research from her experience in developing LEO the Maker Prince, the first 3D printing book for kids. The book comes with a URL where readers can download and print the objects that appear throughout the story and printed models were available at the museum for people to touch and inspect. As a perk, we were invited to experiment with two fun technologies: a Form Labs FORM 1 printer and a full-body Kinect scanning station. 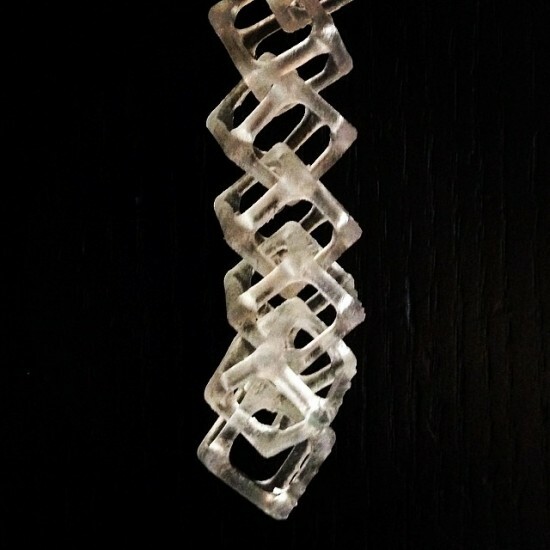 In terms of results, the FormLabs prints capture a great deal more detail at a relatively high resolution. And because the sintered parts don’t require as bulky a structure for support, they are also better at building interlocking and articulated parts than the FDM machines. We spent a good deal of time explore this by building 3D models of chain structures and then printing them on the Form Labs printers. We also took an old pair of eyeglasses and scanned the lenses in order to design and build a new pair of frames, exploiting the detail of the print. The scanning station was also quite fun to play with, and consisted of a Kinect camera attached to Skanect software and positioned in front of a motor-driven turntable that a person could stand on. 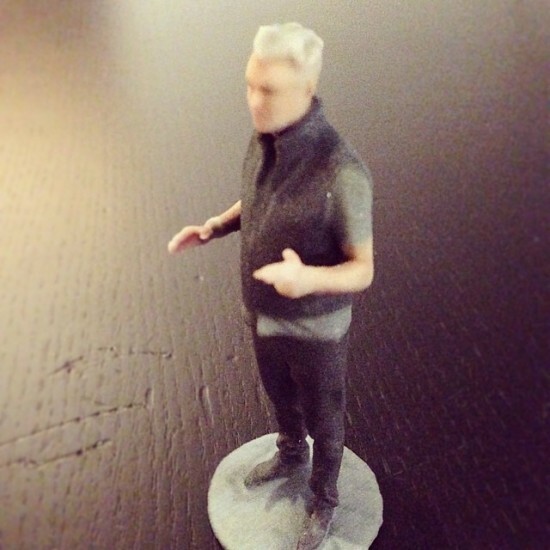 As it rotated, a Shapeways representative moved the Kinect camera up and down in order to capture the 3D data of the person’s body. We hoped to play with the scanner a bit more, but it was outrageously popular with museum visitors who waited on long lines to make scans to use to order small statuettes of themselves. The number of people who come through the museum is astounding and has included Woody Allen and David Byrne. Throughout the six days, most of our time wasn’t spent with the tools, but rather talking to people. 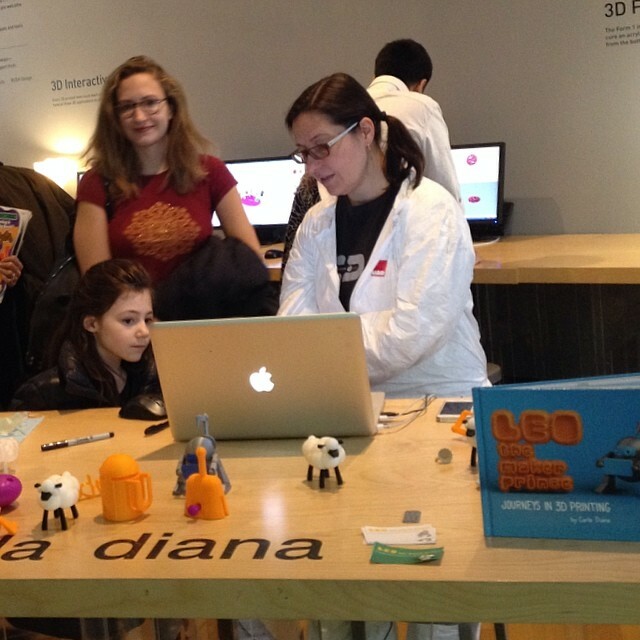 It was fascinating to hear what questions people have about 3D printing and what’s capturing their imagination. While the technology is quite commonplace to professional designers, about 90 percent of the people who came through the residency exhibition said the same thing, “We’ve heard about 3D printers, but had no idea what they are.” People are reading about them in the news, but that’s the extent of their exposure to it, so they found it fascinating to be able to hold and touch a 3D print, and see the process as it’s happening. Even the folks who did have some understanding of the printing techniques were very cloudy on how a 3D model would be crafted and made on a computer, so we enjoyed giving them a glimpse of the solid modeling techniques that we typically use as well as sharing tips about how to get started with more friendly platforms such as TinkerCAD and Autodesk’s 123D suite. 10-year old Asher Weintraub, inventor of the Menurkey. 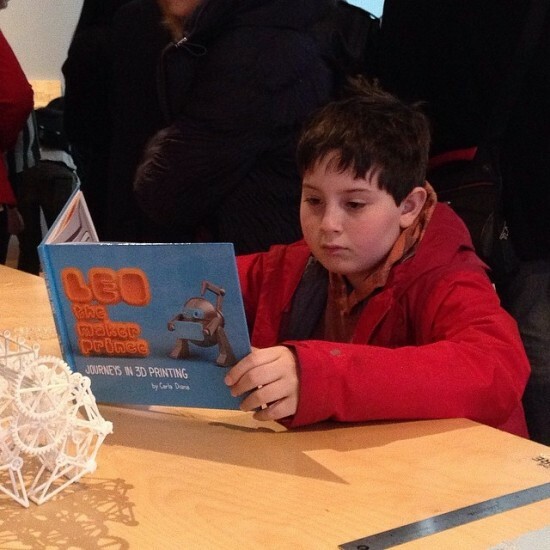 Our favorite visitor to the residency exhibit was 10-year-old Asher Weintraub . We noticed a young boy engrossed in the book and reading intently. When we spoke to his parents, they explained that Asher was the designer of the famous “menurkey” a sculptural centerpiece created to celebrate both Hanukkah and Thanksgiving simultaneously and developed using 3D printing. Upwards of 7000 menurkeys have been sold, and the young designer was invited to meet President Obama in the White House to share his story of innovation. We’re thrilled to know that Asher is a fan of LEO. This week we’ll be sharing our 3D printing fun on the west coast with a LEO the Maker Prince reading and activity day in the San Francisco Smart Studio. We’ll also be at the MakerCon event on May 13-14 and will have several Lab folks floating around the Maker Faire on May 17-18, so if you are in the Bay Area, come find us!